Lions and tornados and beetles, oh my! Well we’ve survived day one! Highlights of the day include being throat punched by a beetle about 3 miles into the ride, eating 5 bugs, surviving the craziest dust devil ever, killer knee pain, the fattest tigers ever and, to top it all off, I got to “pants” a goat in Keenesburg. That beetle literally messed with my breathing for a minute or two. Plains beetles are no joke! I think the eaten bugs are pretty self-explanatory. 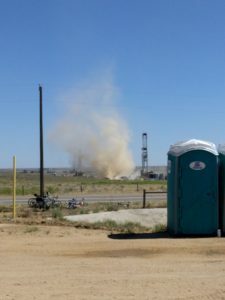 The dust devil at Education Stop #3 was insane!! I was so excited to see the NRCS soil tunnel for the first time ever (because I’m a soil geek and I get excited about things like an inflatable tunnel) when the wind picks up a bit. We all thought it was a quick gust of wind, but before we know it, it’s a full on dust storm! The soil tunnel blows away and I start trying to get out from under the tent I’m in because it started rolling and crumbling and before I know it the soil tunnel changes direction and comes up behind me and starts pushing me through the parking lot! 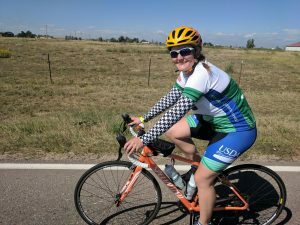 All I could think about was how I was going to be known as the Soil Conservationist that got murdered by an inflatable soil tunnel, and in a USDA cycling kit to boot! I’m didn’t die, obviously, so then all I wanted to do was save the tunnel and video that absolutely insane dust devil (because I’m also a former weather forecast and observer and need to get my geek on from time to time). It was the size of a full on tornado and hung out across the street from the stop for quite some time. From there, I dealt with pretty horrible knee pain that continuously got worse until I reached the animal sanctuary. I considered sagging multiple times, but you don’t sign up for a ride like this AND become a blogger to SAG when the going gets tough. I don’t think I was at risk of injuring myself. I actually think I need to raise my seat. Thankfully PTP has loads of bike experts on hand that can help me figure that issue out in the morning. Thank goodness for all those amazing sponsors and gear folks out here! More updates on that later. Anyways, I stopped off at the Animal Sanctuary, which was amazing! Fattest tigers I’ve ever seen, biggest bears I’ve ever seen and experiencing the sounds of wolves howling and lions being cheeky, was all amazing! After that little break from my bike shoes and riding, the knee pain was a bit better and I was able to truck it to Keenesburg at a pretty sweet pace. So Keenesburg is a pretty cute little town! Biggest thing, that I gotta say was amazing, was that everything was in one place! No need to bus to a party and dinner, the showers were close, the toilets were closer. 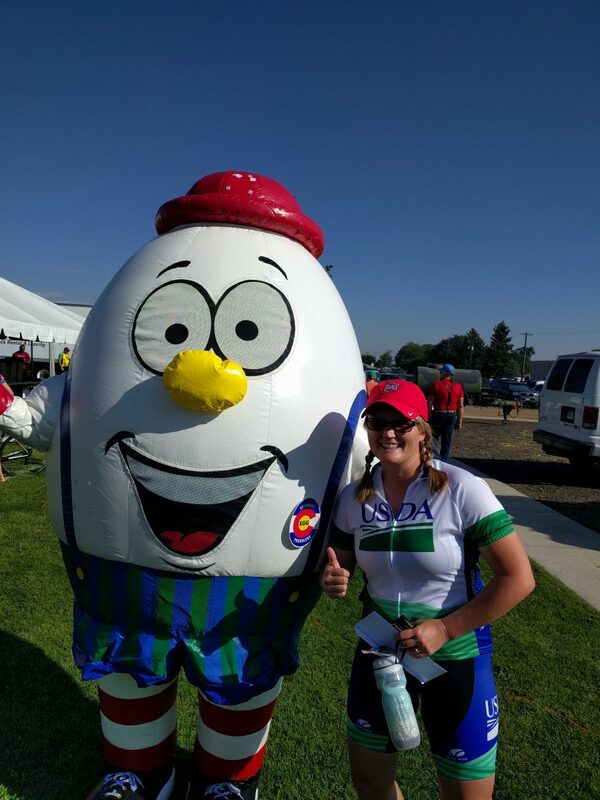 I mean it was the best town set up yet in my two years of riding PTP and supporting my hubby on Ride The Rockies. Not to mention the goody bags they handed out! The people are just too sweet! I’ll end my fun for the day by saying they let us “pants” a goat. Some local brought goats to the fairgrounds and offered for people to try to put boxer shorts on one. Goats are pretty tough little turds, so I can’t say I felt too bad about it, but we did it and I did it twice! It was so funny! If you get the chance, I highly recommend it! I was sure to give them snuggles after to say thank you. The goats, not the locals. So now I’ll sign off as I lay in my tent listening to the wind slap around all the tents on the campground. So relaxing…if you don’t like sleep.